Cammel car rental company welcomes you to the beautiful island of Crete. Our company offers high quality rent a car services in low prices and special offers. Cammel car rentals is a family company, located in Bali, Rethymnon Crete, since 1990, aiming at providing high quality rent car services for any term period. 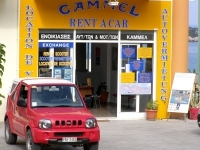 Cammel car rental is dedicated to make your vacation in Crete a unique experience. Our fleet of the latest models and the attractive prices on car rentals are the guarantee for your satisfaction, either for a business trip or a vacation around Crete.